This Disney On Ice Giveaway contest has ended! Please check your email to see if you are the winner and respond within 48 hours. Thank you! To enter into the Disney On Ice Giveaway for 4 tickets to the opening night performance on Oct. 11, 2018 at 7pm at the Florence Center, completely fill out the form below. Last day to enter is Mon., Oct. 1, 2018 at 12:00PM. Read the Disney On Ice interview to the right and check on the correct answer. Kyle has never been to Florence before. Kyle started ice skating when he was 5. Kyle does not like pizza. Which of the following Disney characters will you see On Ice next month at the Florence Center? Tickets are sponsored by Disney On Ice and Feld Entertainment. Entry must be entered through the form above from the HartsvilleMom.com website. Only one form entry is allowed per person. Answering the bonus prompt question as a 'comment' on the giveaway announcement post on HartsvilleMom.com's facebook page for an extra entry is only optional. Winner wins 4 tickets to the opening night of Disney On Ice at the Florence Center in Florence, SC for the Thurs, October 11, 2018, 7PM performance. Anyone who resides in the Pee Dee area is eligible to enter. Winner will be notified by HartsvilleMom.com via email on Oct. 1, 2018. Potential winner will have 48 hours to respond back. If there is no response within that timeframe, HartsvilleMom.com will do a second drawing from the submitted entries. Winner's name will be announced via HartsvilleMom.com's facebook page after the conclusion of the drawing. 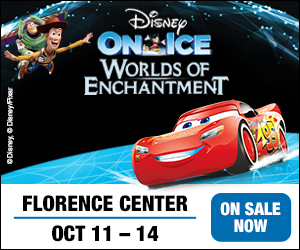 On Sept 12th, 2018, FlorenceMom.com (our sister site) had the special opportunity to interview Disney On Ice star, Kyle Shropshire, who performs as Woody on Disney On Ice presents Worlds of Enchantment! Kyle and a grand team of talented ice skaters will portray an outstanding Disney cast that includes (but not limited to) stars like: Ariel from The Little Mermaid, Elsa and Anna from Frozen, Lightning McQueen from Disney●Pixar’s Carsand of course, the rest of the gang from Disney●Pixar’s Toy Story 3 and they are coming to Florence, South Carolina next month from October 11, 2018 - October 14, 2018 for five performances at the Florence Center! At 23 years old, Kyle has been skating since he was 2 years old, which makes him a very seasoned ice skater with two decades under his belt! During the interview, Kyle and I chatted about his favorite places to visit, tips for kids who want to become a professional ice skater, and how the holidays can make one miss their family. Here are the highlights from the interview! FM: Where are you originally from? Kyle: I’m from Algonquin Illinois, which is just outside of the Chicago suburb. FM: Where are you located now? Are you rehearsing or performing tonight? Kyle: For this show, Disney On Ice Worlds of Enchantment, we are at the rehearsal studios right now (actual studios' location has been omitted by FlorenceMom.com to protect all Disney On Ice stars' privacy). We have 2 weeks here for rehearsals before we go out on the road and start performing! FM: How long have you been skating for Disney On Ice? Kyle: This is my sixth year on Disney On Ice. FM: When you found out, before you started working for Disney On Ice, that you were going to be a star, was it like a special phone call while you were shopping, and were you like jumping up and down in the middle of a store or something like that? Kyle: Not exactly! (laughing) I definitely was excited. So I’ve been skating since I was 2 and my mom was in the Ice Capades back in the day and she became a coach so I grew up skating. Skating was a huge part of my life; in my family’s life. I’ve been competing up until I was about 18. I always knew I wanted to do shows at some point, just any kind of professional show. And I thought Disney On Ice is a good place to start. So when I sent in an audition video, I got an email back sooner than I thought! From there, it kind of just took me on a life adventure for sure. FM: Well, you must have sent in a very awesome audition video for them to email you so quickly and want you on the show! So then, you’ve been traveling around the US even before you were a part of Disney on Ice, right? Kyle: Yeah, just a little bit. In Chicago area, I skated and then when we did competitions, it was kind of more in the Midwest. So when we did regional competitions, we would travel around the Midwest. And then, I went to some junior nationals when I was a kid and I did nationals when I was a little older. I went to San Jose, California and a couple of different places for different competitions around the states. FM: And now that you’re a part of Disney On Ice, I’m sure you’ve also traveled to other countries outside the US, right? Kyle: Yeah, yeah. So when I first started, I did mainly just states tours and this tour that I’m on is all states but I got to go to about 15 countries. I went to South Africa. Last year, we did a whole Eastern Europe tour so I got to go to Serbia, Poland, Germany and I just came back from Japan, actually. Such a great opportunity to travel and getting to skate in all of those countries has been surreal! FM: You said you’ve been skating since you were 2. How many years have you’ve been skating counting all of those years? Kyle: I’m 23 now so basically, 20, 21 years now! FM: Wow, two decades. What are your proudest achievements so far? If you could just name the #1 best achievement, what is it? Kyle: This job is definitely one of my best achievements. It’s very rewarding as a job to growing up skating and working really hard and training a lot. Then to now, get to perform for kids and make them smile and really bring joy to families and bring families together. This job doesn’t really feel like a job. It’s a really exciting lifestyle. I’ve met lifelong friends. People have become my family here. And it’s definitely a great experience to get and I’m really grateful for that. FM: How many hours of training and rehearsal do you usually have on an average day? Kyle: Right now because we are building the show, and doing 2 weeks of rehearsals, our days are kind of long. We’re doing a lot of on ice stuff, off ice, costume fitting, learning steps and kind of drilling things over and over again to make sure it’s all good to go. Once we get onto the road, mainly our rehearsal process is basically just the shows and you get notes from each show that keep getting the show better and better! FM: I hope you get a couple of days off per week to just relax for a little bit. Kyle: Yeah, usually when we get to a city depending on when we open a show, we have a couple of days off and we have them free to ourselves to explore the cities and explore the towns and eat the good food and all of that stuff. FM: What’s your advice to kids who dream of being just like you as a professional ice skater and performer for Disney On Ice? Kyle: Definitely to strive to be your best. It’s a really great job to have and really great opportunity as a skater. Skating is definitely not an easy sport and it’s hard to push through. You keep going with it and not get discouraged. There are so many good skaters out there, and it's such a hard athletic sport but I think that the job gives a great outlet of fun and new exciting adventure with skating. So I would hope that kids can stick with it and work hard and really find the joy in skating that we try to bring to the ice at all times! FM: Are most of the skaters, who’ve worked with you, like you and started when they were little? Kyle: It varies but I would say the majority of the skaters here have started when they were younger. I’ve definitely known some people in this company who have started a lot later and they’ve just been really driven to get in this job and skate for a living. So, it’s definitely doable if you start later. But it just all depends. Yeah, but the majority of the skaters have started when they were younger. FM: So when you say later, were they like teenagers or still in elementary school? Kyle: Most of the latest that I’ve heard is around like 13. A couple here and there that maybe have started later than that but most of the time they are teenagers or 10 years old. We have skaters all over the world so some skaters came from other countries that maybe didn’t have an outlet of skating when they were younger and so they didn’t get into it until they were older. FM: Have you had any injuries from ice skating? Kyle: I haven’t had a ton of injuries compared to some people. I’ve really only fractured my knee briefly. I actually ended up still skating on it because I was told it was a bruise so I didn’t get an MRI for a couple of weeks. When I got the MRI, that’s when they told me. I wasn’t really bedridden for it or didn’t have to rest much for it ‘cause I didn’t really know. That’s kind of what the worst I’ve had. FM: Well, you’ll be skating as Woody for Disney On Ice presents Worlds of Enchantment! My sons have watched all of the Toy Story movies and they have all the toys, including Lotso and the aliens! Kyle: Awesome! Well they should come to the show because we have Lotso and the aliens. Our show tells the whole story of Toy Story 3! We have Andy and the green army men number and it goes into all the toys coming out like Slinky, Bullseye, Ham and Rex, Mr. and Mrs. Potato Head. It’s a really fun show. It shows a big story about Toy Story that everybody usually loves! FM: Oh yeah! My sons will be very excited to see you and the whole production! Disney is just so special. What do you think makes it extra special about Disney On Ice, that you can tell us before we go see the show? Kyle: For any Disney On Ice show that we have, it’s really cool to bring it to your city. Instead of having to go to the parks to see these characters, we get to travel around the states and get to go to that specific city. Then, in terms of on ice, we’ve added a lot of tricks and athleticism to it so it’s really fun to see those characters in a different way, in a different action and we bring them live to you! Like our show, Worlds of Enchantment features Pixars Cars as well, so they come live on the ice! McQueen drives himself and you know we bring that and have pyrotechnics! FM: That’s amazing! Do you miss home from all this traveling? Does it make you homesick? Kyle: Yeah, a little bit. Around the holidays are a little hard. We still have shows during the holidays. You know, because you go on the road with so many people and they’re going through the same things you are, they are away from home as well. You become each other’s families. You learn how to work through that and you enjoy your times together. But day to day, trying to pack up your bag and then go to another city all the time, it’s exciting but also draining as well. When you do get to go home, you get to be home and relax in that one place for a while! FM: There’s no place like home right? What’s your favorite food to eat? Like if you can order anything you want right now, what would it be? Kyle: Oh man. I definitely like pizza. Being from Chicago, we grow up with a lot of good pizza around. Pizza is kind of a good go-to dinner for me. Pizza or tacos! FM: Do you plan on visiting loved one soon? Do they get to travel to see you instead? Kyle: Hopefully my family will get to travel a little bit. Maybe during around like Thanksgiving time, my family will be able to come. We’ll be in Greenville, South Carolina around that time so hopefully they can come then. Maybe if there’s another time that I can go home, maybe I’ll be able to travel home for a couple of days and visit. FM: I know you’re probably an expert traveler now. Have you been to Florence, South Carolina before? Kyle: I’ve been to a lot of cities on tour but I don’t think I’ve ever been to Florence. FM: Well, we're so glad you're coming! So, we’re in the middle of a hurricane season right now! Kyle: Oh right, I was going to ask you. I know that the hurricane is coming to that North Carolina, South Carolina border there. It’s going to hit pretty hard, it seems. FM: And tomorrow, it’s forecasted to be coming! We went to the grocery store two days ago and bottled waters were flying off the shelves. I couldn’t find water on Monday so on Tuesday, my husband had to rush in the morning to get there. It’s been really crazy over here. Kyle: Hopefully you guys stay safe over there. Are you guys in a hard area for it? I know it’s kind of covering all the Carolinas. FM: So Florence is about 70 miles from Myrtle Beach so we’re inland from Myrtle Beach and a lot of them are probably coming here to evacuate. If you could live anywhere, where would it be? Kyle: Probably my favorite places have been like Poland and Germany. If I have an opportunity to live there, it would be pretty cool. FM: I was looking at the website and I noticed that you’re starting here on the East Coast and then you’re eventually going to go to California. Is that correct? Kyle: Towards the end of the tour, we go to Colorado and Phoenix, and then we end up in a couple of cities in California as well. FM: I was originally born and raised in San Diego! Kyle: Actually, my mom was too! My mom’s side of the family all lives in San Diego. My dad’s side of the family is from more north, like Stockton, Modesto area. I have a lot of family in California. FM: So you visit pretty often? Kyle: Yeah! My dad works for United actually, so we’re fortunate to be able to grow up flying all the time. So we flew to California all the time to visit everybody. FM: It’s so awesome that you know a lot about the East Coast and the West Coast. You’re traveling a lot. You’re very well-grounded. Kyle: It’s nice when you get to go to a city where you know people or you have family there. On your days off, you can hang out with them or they can come see the show and have dinner afterwards. It’s kind of a nice, comforting feeling when you’re moving, moving, moving on the road. FM: Thank you Kyle for taking the time to spend a moment to talk with me today! I can't wait to see you perform next month! Kyle: Thanks and stay safe during the hurricane! Disney On Ice presents Worlds of Enchantment will be an amazing performance at the Florence Center in Florence, SC! With pyrotechnics, amazingly skilled ice skaters performing as Disney stars featured from four different Disney movies, these performances are sure to enchant and bewilder! Get ready to enter a dazzling world of Disney magic, live on ice where Lightning McQueen, Mater and the crew of Disney●Pixar’s Cars perform high-speed stunts and race across the ice like you’ve never seen before! Be amazed and join Ariel as she dives into the underwater kingdom of Disney’s The Little Mermaid. Buzz Lightyear, Woody, Jessie and other favorites from the Toy Story gang as they try and escape from Sunnyside Daycare in one of their most daring adventure ever from Disney●Pixar’s Toy Story 3 – proving that the toys are back in town! Plus, enter the wintery world of Arendelle with sisters Anna and Elsa from the BAFTA and Academy Award® winning and number one animated feature film of all time, Disney’s Frozen. Join Anna as she embarks on an epic journey with the hilarious snowman Olaf and rugged mountain-man Kristoff to find her sister, the magical Elsa, whose icy powers have trapped the kingdom of Arendelle in eternal winter. From wheels to waves, icy wonderlands to infinity and beyond, see some of your family’s favorite Disney moments come to life at Disney On Ice presents Worlds of Enchantment. Tickets for Disney On Ice presents Worlds of Enchantment start at $20. All seats are reserved, and tickets are available by calling 800.745.3000. For group rates and information, call 866-248-8740 x4. To learn more about Disney On Ice, produced by Feld Entertainment, visit www.disneyonice.com, or visit us on Facebook and YouTube.